Paul Taggart is the founding partner of Taggart and Taggart. Long respected in the water rights arena, representing businesses and municipalities in transactional and litigation matters, Paul’s practice includes water rights acquisitions, sales, contracts, easements, well share and water delivery agreements, adjudications, permitting, extensions, transfers, certification, regulatory compliance and litigation of water rights disputes before state administrative bodies as well as State and Federal trial and appellate courts. Additionally, he practices real property, real estate, land use, redevelopment, complex and general civil litigation, and administrative proceedings. Mr. Taggart provides his clients the unique combination of legal experience combined with particularly skilled considerable success in representation of clients and projects. He continues to be actively involved in working with and handling matters and individuals, corporate clients, business owners, contractors, developers, and lenders throughout Nevada look to Paul to represent them in complex water law cases and issues. 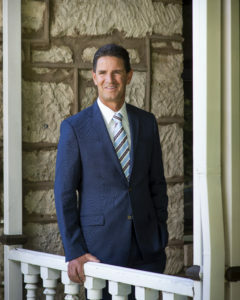 Mr. Taggart was at the top of his law school class, graduation Order of the Coif., receiving his law degree from University of the Pacific, McGeorge School of Law in 1994 and is licensed to practice law in Nevada and California. Mr. Taggart is admitted to practice in the U.S. Supreme Court, the U.S. Court of Appeals for the Ninth Circuit, the Nevada Supreme Court, and the Federal District Court for the State of Nevada. During his time as Deputy Attorney General, Mr. Taggart served as lead counsel in Nevada Dept. of Human Resources v. Hibbs, 538 U.S. 721, 123 S. Ct. 1972 (2003). He represents clients before the U.S. Court of Appeals for the Ninth Circuit and the Nevada Supreme Court on a host of appellate matters, including direct appeals, writ practice, and petitions for review and amicus briefs. He also handles appeals from administrative decisions. He guides his clients in all aspects of appeals, from ensuring that appellate issues are properly preserved in the trial court to delivering succinct and persuasive arguments in briefs and at oral argument before appellate courts. He practices in broad and diverse areas of complex civil matters in state and federal court in both Nevada and California. As a former judicial law clerk for the Supreme Court, he is particularly skilled in procedural issues. Mr. Taggart is well positioned to assist clients with a host of water and resource related issues and helps with permitting and regulatory matters before state and federal agencies. He serves as outside counsel to the City of Fernley and serves as general counsel to one of the largest municipal water purveyors in Nevada, the Southern Nevada Water Authority. Mr. Taggart’s time as a Deputy Attorney General provides him with a unique perspective on water litigation in Nevada. He has experience litigating both against, and on behalf of, the State Engineer. He is a state-wide leader in water law, and handles many individual water resource related issues, including developing water rights for snowmaking at ski resorts, proving water rights in adjudication processes, filing appeals of State Engineer Rulings, and filing water right transfers. His work has included representation in matters before the Nevada State Engineer and California State Water Resources Control Board, as well as state and federal courts. He has served as legislative counsel for clients during sessions of the Nevada Legislature. Through a combination of effective advocacy and negotiation, Mr. Taggart has built a reputation for litigation excellence and for providing high quality service to his clients His first priority centers around prevention and how to avoid being vulnerable to a lawsuit. He ensures his clients are positioned to prosecute and defend claims that are levied and makes certain that careful, appropriate, strategic consideration of costs and benefits and work to resolve matters outside of the courtroom. Mr. Taggart recognizes that business and commercial clients have goals and expectations and those litigation strategies, including alternative dispute resolution measures and techniques, can be developed to assist in attaining them. He is a skilled litigator who understands the interplay between federal agencies, the roles of various officials, and how to forge relationships and achieve results within these complex environments. His approach is guided by his constant desire to effectively optimize his clients’ objectives and goals. During his tenure at the Nevada Attorney General’s Office, he served as board counsel to various state agencies, drafted Nevada Attorney General Opinions, and prepared and reviewed proposed Nevada administrative regulations. Mr. Taggart has represented a number of major real estate development projects in Nevada in connection with acquisitions, entitlements, securitization, financing and sales. He has represented clients on water rights acquisitions, securitization, service commitments and change applications and handles water rights transactions and litigates water and real property disputes. He also has experience with land use planning and representing clients before local government planning commissions, city councils and county commissions and advises Sparks on redevelopment and economic development issues, Mr. Taggart is experienced in the formation, operation, disposition and dissolution of family businesses, private companies and other enterprises including real estate developers and industrial property owners, and has significant experience in the negotiation and documentation of commercial leases and related matters. He has also provided legal advice to Carson City and Sparks on redevelopment matters and served as General Counsel for the Tahoe Transportation District. Mr. Taggart is on the board of trustees for the Galilee Episcopal Camp and Retreat Center. He has provided pro bono services in this participation with the Volunteer Attorneys for Rural Nevadans program. He has actively coached competitive soccer and basketball for six years in Carson City. His interests include running, cycling, swimming, rock climbing, mountaineering, and skiing. Western Water Law: Emerging Issues and Concerns (“At the Boiling Point?”), Southern Nevada’s Pipeline Proposal, February 2018. Nevada Water Resources Association Annual Conference, Water Reuse/Wastewater Panel, Moderator, February 2018. Nevada Water Law: Managing a Scarce Resource, November 2017. Getting Wet: The 2017 Legislature Dives into Water Law, August 2017. Douglas County Bar Association, Water Law Panel Discussion Including Legislative Updates, August 2017. Boundaries and Easements, Understanding Riparian and Water Rights, September 2016. Western Water Law Conference, Federal Public Land: Government vs. Permittee Interests in Water Rights and the Case Study of Grazing, February 2017. Nevada Water Resources Association Mine Water Management Symposium, Exhibitor, February 2017. Nevada Water Rights and Uses with Land, August 2016. Water Resource Management, Science and the Law, Presenting the Science of Hydrology at Hearing and Trial: How the Legal and Technical Pieces Fit Together, May 2016. Nevada Water Resources Association, Whiskey’s fer Drinkin’ and Water’s fer Fightin’ fer Speakeasy, March 2016. Nevada Water Resources Association Fall Symposium, Socio-Economic Effects of Curtailment, Panelist, October 2015. National Ski Areas Association Western Winter Conference & Tradeshow, January 2012. Water Rights Adjudication in Nevada, June 2006. State District Court Jurisdiction of Appeals of Permits or Adjudications, Nevada Water Law, October 2005. Western Water Law, Co-Chair, 2004. Addressing Water Shortages with Prior Appropriation Principles, Nevada Lawyer, Vol. 24. Issue No. 7, July 2016. Water Rights, Allocation and Resource Management in Nevada, 2004, 2005, 2006, 2007, 2008 and 2009. Recent Development in Tribal Water Rights, Nevada Water Law Conference, 2001. Nevada’s Water Right Adjudications, An Update, Western State Adjudication Conference, 2001. Update on Nevada Water Law, First Judicial District Bar Association, 2001. Nevada’s Water Right Adjudications, An Update, Western States Adjudication Conference, 2000. Recent Developments in Nevada Water Law, Nevada Water Law Conference, 2000. Nevada’s Water Right Adjudications, An Update, Western States Adjudication Conference, 1998.